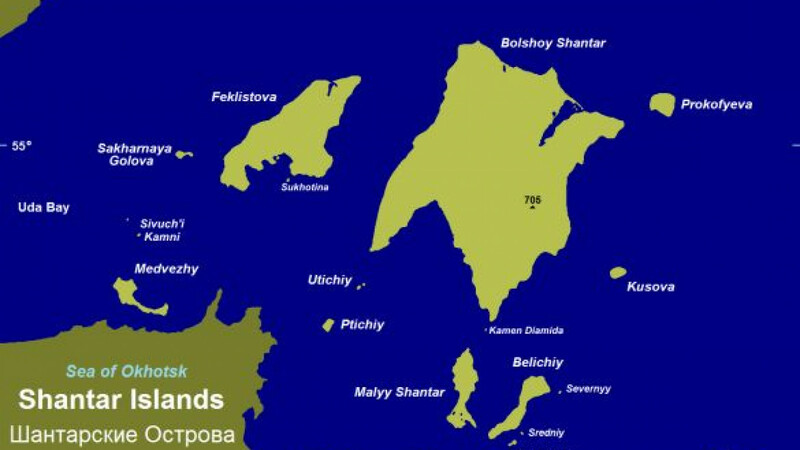 A map showing the Shantar Islands, where a lighthouse picked up a distress signal issued by the missing Amurskoye motorboat early Sunday. A motorboat went missing off Russia's eastern seaboard Sunday with 11 crew members on board, news reports said. The Amurskoye motorboat last made contact with marine authorities early Sunday morning, when it let off a warning signal in the Sea of Okhotsk, RIA-Novosti reported. A lighthouse on the Shantar Islands picked up the signal and alerted local search-and-rescue authorities, Interfax reported, citing a representative of the Far Eastern Federal District's Marine Traffic Control Service. Authorities redirected a nearby tanker to the location where the motorboat last made contact, but the motorboat was nowhere to be seen. Additional search-and-rescue operations are under way, but emergency officials said rough conditions at sea — including low-hanging cloud and high winds — are preventing airplanes from joining the rescue efforts. In the South Sakhalin Rescue Coordination Center, officials are hopeful that the Amurskoye and its crew will soon be found. In comments carried by RIA-Novosti, rescue officials speculated that the motorboat's emergency buoy could have fallen overboard in the Sea of Okhotsk's choppy waters, automatically triggering the buoy to send warning signals to shore. The Amurskoye is registered at the port of Nikolayevsk-on-Amur, the closest port to the Tartar Strait, which separates the mainland from Sakhalin.